A great price. Lovely family running the place. The food in the restaurant is outstanding, we ate there 90% of the time. Recommend the Panang Curry! The New Deluxe was literally brand new. Sleekly designed, clean, comfy, cool and seconds from the pool, private beach, and absolute serenity. You can hire bikes directly from reception for 200B/ day which is decent and so convenient to explore the Island by yourself. STAY HERE! The accommodation was really nice and very clean. The location is also great. Grandpa's & Grandma's rock, 7-11 and family mart can be reached in about 5-10 minutes by feet. The personal was also nice and friendly. There are kayaks we could use for free! Satisfied with my room which is in front of the sea & pool. my kids really excited since they can go for both. room are ok, big(have space for pray) & clean. only amenities like shampoo & shower foam are not ok. for showe bath, we only got small soaps.maybe they should consider it. The hotel itself is nice. Great place for relax. But! Not during construction ! They have a construction at the property every day from 8am to 5pm! Very noisy ! This is crazy ! They have to reduce the price for this property during construction ! I was writing Agoda and asking them to refund my booking and I was planning for booking something else but they didn’t help me also! Everyday from 8am to 5pm all I can hear is redicilous construction noise! From everywhere! Because they are making construction on the beach itself! And also they are making the new building. Very stressful! This is a nightmare! DONT GO HERE! Very helpful and polite staff. They went out of their way to help us with many things. Delicious breakfast. Room was clean and tidy. Access to the beach only for guests. Great value for money. Bikes to rent available. Wonderful please to chill out. There are a few restaurants around. If you are looking for a busy party place though, Chaweng beach would be a much better choice. This review is only based on the lady I met at reception. I cannot comment on cleanliness, facilities etc. I had booked a room for a night but they couldn’t accommodate me due to plumbing problems that they had tried unsuccessfully to fix before my arrival. The lady was extremely apologetic and she put me up in another very nice hotel 1k away - this location was actually closer to Lamai which suited me better. She drove me to the other hotel and checked me in, making sure I was happy with the room before she left. The place seemed nice but it is under construction so one to keep in mind if you like sleeping! My boyfriend and I stayed here during our time in Koh Samui and were thoroughly impressed, the friendliest staff who couldn’t do enough for you and the most amazing spot, nice pool and private beach where you can rent kayaks free of charge! After a month of visiting Thailand this was our favourite accommodation by far. Only bad thing we would have to say would be that the location is quite remote, but you can rent a motorbike for quite cheap which is a good way to see all the attractions and towns close by. We hope to return in the future to this beautiful place. 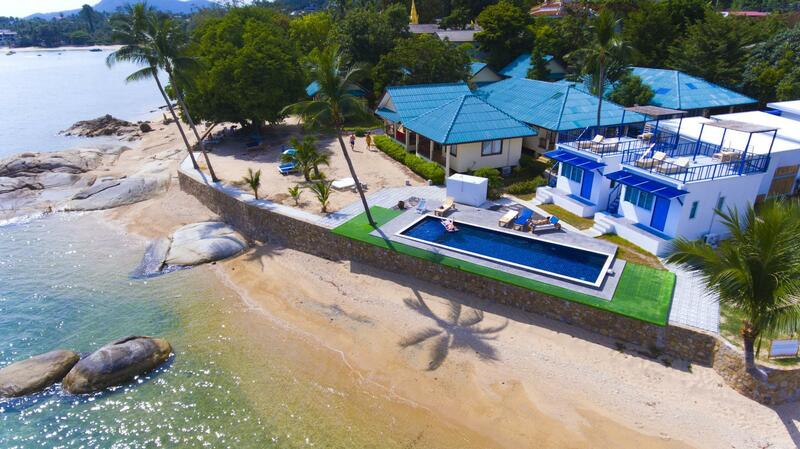 We really enjoyed our stay at Three Trees Samui Resort. We got the beachfront bungalow with a private rooftop with beautiful sea views. The staff was extremely helpful and friendly. There is a nice swimming pool with lights at the night, plenty of privacy. The beach is not the most beautiful in Koh Samui but it's still one of the best ones on the island. I highly recommend this place to anyone! Fantastic holiday in a quiet place run by local people. Not too far from shops, food market etc., I would recommend hiring a scooter. Great accommodation, clean, room service, clean free towels, beach towels also available. The best accommodation so far as we don’t like spending lots of money. Air conditioner spot on. Comfortable rooms. We rented bungalow at the beach with kitchen. Great atmosphere & amazing pool. Thank you so much for super time!!! Ella, Ben & Finley. Very Nice Hotel with nice rooms or studios, some with kitchen. Location is quiet, just 5 min with scooter (can be rented at Hotel) from busy and noisy Lamai. Rooms are well mainained and several rooms have a kitchen. Cleaning is good also. Staff is very freindly - excellent breakfast. Nice pool and "private" beach. Excellent value for money. We had a very pleasant time! Perfect location for relaxing in the sun, taking a nap on the beach and just enjoying a book. Everything was perfect. The bungalows are really nice and clean. The hotel staff is very friendly. In 15 min walking distance there is a big supermarket and after 10 min you find a lot of restaurants. Only the walking along the street isn't that nice, but was fine for us. it is on the main road,easy to rent a motor and get a thai massage. there are a few restaurants in walkabledistance and we visited the shooting range next to. room is spacial and has everything we need,if they have dryer would be nicer. we swim there everyday and had fun in their free kayaking. the owner helped us with the ferry and transit tickets which is cheapest one i have got comparing with the ones i have ckecked on internet. would come here again. Accomodation. The setting. Prim & her staff. This was our 2nd stay, we went back because we love everything about Sarocha Villa. The surrounding gardens are really lovely, it's fabulous waking up sliding your doors open & looking directly at the Private Beach & lapping sea. It is a very restfull place. It is well maintained & the chalets are very clean. You walk through the gardens to have breakfast served in an open wooden stilted building. Lunches are served there & it is exellent food. We plan to go back again on our next trip to Koh Samui.